It might be silly, but everybody likes trophies. Some people think that getting trophies is a silly thing. Especially, grown men and women vying for a silly trophy in fantasy football. But regardless of how silly it seems, it is fun. Getting your name on the trophy at the end of the season is something to be relished. And in our league, it gets relished for the whole year until the next champion’s name gets etched onto the trophy. It may not seem like much, but it is nice to have those bragging rights with the trophy on your desk or shelf. As silly as a physical trophy for putting together a statistical football team might seem, getting digital trophies is even sillier. And yet, I look to see who gets those each week. The three trophies awarded each week in our league are Top Player, Unreal Combinations, and High Scoring Bench. Top Player is awarded to the team that fields the highest scoring player that week. Unreal Combinations is awarded to the team that fields the highest scoring pair of players that week. And High Scoring Bench is dubiously given to the team with the highest scoring player left on the bench. 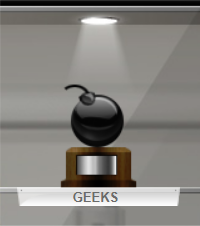 The Bench trophy is a bomb like you might see in the old time comics. 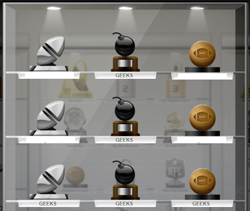 In reality, I did not start looking at the trophies until about mid-season this year. I am not even sure why I looked, but I noticed something interesting when I took that first peek. Somebody had won all three trophies. I was flabbergasted. How could somebody get all three trophies? Then, I looked. My friend had started a high powered quarterback and running back and left another high scoring quarterback on the bench. I was amazed that such a thing could happen. Truth be told, it is not so bad to win all three trophies when you win the game. But it is quite another thing to “win” the booby prize when you lose the game. Especially, when you would have won the game if you had not won the trophy. When all is said and done, we do not give participation trophies in our league. And nobody really cares about the weekly trophies. The only trophy that really matters is the one given at the end of the year. We all want to bask for a year in the glory of our statistical achievements. We all want to be fantasy football champion and hoist the ultimate trophy. Silly, I know. But everybody likes trophies.